"I Am a Human-Not a Mistake"
I want to talk to all human beings in this land that we call free. I don't care how hard you've had it thrown in your face, we all are survivors! We all fight the good fight until the day we die, then it's to late for regrets-because at that point-it's all been said and done. Some will tell you that life is not a fight. Yet others will test your will to survive--still others that will bring you to the breaking point! We justify ourselves--telling each other--that we are just as competitive as the next guy. If you're a nice guy in the business world, they say "nice guys finish last!" But at some certain point, you have to admit that someone else's rights are infringed upon. What does it matter--when you're making extra money--who's feet you step on? Why did you go out of business? That's the business world and for many the work place as well. Why did people move on to another position? But what if a company's rules of public policy draws a line in the sand of human rights? What rights do the homeless have? Are they all secondary citizens or are they stereotyped as vagrants? What if they merely wanted to use the facilities at your place of business? Would you let them? Yeah, now I am talking to all human beings in the land we "call" free. Would you let them to use the facilities? I am asking you to! "Oh, but a lot of them do smell," you say. Well, I guess they'd smell "even worse..." if they did the "unspeakable" in their pants! So you just send them on their way, because, after all, it's not your problem. And what is this man's hope for survival? But what really, is the message that you giving this man? We all have needs and wants-but you have denied him his rights! You are denying that person the very smallest degree of human compassion! Some would say you are denying that person his right to exist! And really, aren't you essentially denying the very core of common life that we all share as human beings on this earth? For some, their very thread of existence is being threatened. We all are human beings that share this earth, and this message is for all human beings that call themselves "men." For the love of mercy, allow me to be ...human! So now that man or woman has left your establishment with some kind of feeling of helplessness. No one cares about their plight anyways. "They'll take their business elsewhere," says the homeless man. And the manager tells him to "do his business elsewhere," then laughs! We all can laugh at another person's predicament, until "our number" comes up...then; hopefully, it's only a number one and not a number two! So let's just throw in the towel "for" him, call the police! But when you make that call, when you deny that person his rights--aren't you denying a part of yourself? And when you give up on them, at what point do they give up on themselves? Aren't you denying the human spirit that lives in all of us? After all, at some point in time, "you" might have to take your place in "that line." I pray that you are shown compassion and not told to "tow the line". "Instant Answers for an Instant World"
Computers, what would we do without them? We use them on a daily basis-from holding our bank accounts in check; to obtaining directions from public transit; to checking on credit cards, to keeping our engines in tune as we travel down the road and even guiding rocket ships to the moon. Computers- in the business world- are an image-oriented device. The better the image-the more professional you look-the easier you'll sell on the internet. People use e-mail to save time and energy-as well as money, since there is no postage involved. But isn't it true that sometimes the computer is also responsible for a lot of frustration in this world? What "you" consider to be a mass mailing program-to save money-- others consider as "spam"--and it's "your mail" they mark as such. Getting rid of unwanted advertisements can be time consuming and tedious. But have we all done it to a certain point-mass mailing? From that perspective, the computer can be responsible for a lot of "headache" and frustration in this world? It can be frustrating weeding through all that junk mail. But doesn't that junk mail represent a persistent salesman? Oh... if only we lived back in the "old" days we would get "rid of him" or tell him off personally! Is every answer the computer gives you -necessarily the solution to your problem? Oh, you say, "give us the facts and the figures-- the computer will do the rest"! So who controls the "facts" and the "figures?" Aren't the web sites written and controlled by individuals--who may have the answers to your problems? But don't you realize that an answer the computer gives you is also by necessity --someone else's perception of an issue? He just wants you to buy-buy -buy his product! Or if you would-- buy into his way of thinking. But what really is at stake? Our world has become an instant world, and we want our answers "instantly". From when we wake up in the morning with our instant coffee that we don't have to brew, we are given instant answers to our problems--that aren't necessarily solutions. Let's start with a flat tire that's fixed in a can; to a doughnut tire that don't hold air; from an oil additive that guarantees to prolong engine life; to a pharmaceutical drug that tells you what's wrong with you! Life today has become somewhat reminiscent of a song from the sixties, "In the Year 2525"..."everything you think, do or say is in the pill you took today." There is no longer any need to think because --"some machine is doing that for you". The computer doesn't make mistakes -just ask any programmer! May "your" bank account always reflect that! But you know what? Not every prescription "they" give you is the right one! Not every doughnut tire will hold air until the time you need it. Not every oil additive is good for your cars' engine-some are actually harmful! After adding one qt. of magic oil, "instantly", the noise went away. You sold the car and "instantly" it became someone else's problem-not yours! After all -I'm not my brothers' keeper! Alright, so we wander off to the mechanic for answers to the car's problems, but can they even "read" the onboard computer? But not every mechanic is a good mechanic! Did they sell you a set of "muffler" bearings and laugh at you? Or did "he" slip in a quart of magic oil and send you on your way? But who, really, is the greater fool? The computer can be used, just like the television, to program "you" into buying into whatever product or service they are selling. It's the media now, so here's another example: a pharmaceutical company recommends their drug... and warns you beforehand of dangerous side effects. So the advertisement tells us! If we ask "our" doctor for "their" drug advertised on T. V., was the medication the solution to our problem? Their giving you a solution to your problem without knowing your problem-they're not doctors! Isn't that the real issue? That's why they warn you of dangerous side-effects, they want to avoid a medical malpractice lawsuit. Let me draw a parallel that is similar in nature. Isn't this very scenario like going to a mechanic and before he even opens the hood--telling him what's wrong with your car? Why not let "them" diagnose your problem and advise you as to what your problem really is, and then inform you as to your alternatives. Of course a doctor has only two models to figure out, male and female--whereas a mechanic has many models that he has to know, Buicks, Oldsmobile's Chevy's' etc.--so go figure it ! The truth is, how many people have been misled by the TVs' advertising programming and swallowed their pill, and like the magic oil guaranteed to prolong engine life-"caused" more problems "internally" than it solved? So you say to yourself, "how does that related to programming people to buy online?" Is that the way to put it? So what is the difference between promoting something or jamming it down their throat? Of course not everybody becomes our "spam" that we don't want to eat! So come on, doesn't the television show us how to be successful--much like the computer-an image to be perceived? We all want to be like someone! But isn't; it also a result of someone else's perception of the world that we all share--however right or wrong it may be? If it's an instant world, will instant answers always be "our" solutions? But isn't advertising the medias' way of shaping our way of thinking, reinforcing our decision to buy into their product or services? The computer -they say it saves us time and energy. How many people's jobs are lost by the computer revolution? Was it a friendly checkout girl at Smith's that had to leave? They have the computer work the checkout instead, someone's job was lost! If the price was right or wrong on some certain item-- you're not to question the computer! And yet it has been wrong for me and I dared to question it! How many times have you cursed at the "computer" generated voice that put you into a "permanent" holding pattern? They eliminated a telephone operator and put the "whole nation" on hold! They are so much as saying that "their" time is worth more than your time! The very cell phone's computer system can put you on hold until the day you die! For a comical look at an old mans' effort to set-up a cell phone for service on his birthday, check out the new one-act-play, "Fishing on Your Birthday", at this URL address: http://theatre84110.tripod.com. 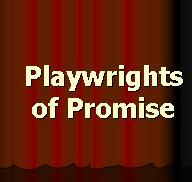 To comment on this article, go to the blog site that is accessible from "Playwrights of Promise" home page entitled: Playwrights Box. I went ahead and set up the reading of the play, Just One Rose at the library and I had a turnout that I could deal with. I found out later a bunch of friends had showed up and yet were afraid of interupting the reading . It is to bad that you didn't as we could have used a couple more readers as well as more feedback. Overall , I heard a lot of good comments on the play! Thanks for comming out to the reading! Well, this playwright is going to believe in his work and has scheduled an open reading which takes place on Novermber 8th, a sunday at 2 pm. The play has not had a public reading as yet and so this is overdue. The play centers around a man that has lost his wife in the world trade center disaster. What it was like for others like him to have to resolve themselves to the fact that they are gone and where they are "now" buried. And they can not go looking for them. That is their friends grave site, The World Trade Center.